Note: This is a true story that helps us understand that things happen for a reason. Submitted by Pastor Rob Reid who says God does work in mysterious ways. The brand new pastor and his wife, newly assigned to their first ministry, to reopen a church in suburban Brooklyn, arrived in early October excited about their opportunity. When they saw their church, it was very run down and needed much work. They set a goal to have everything done in time to have their first service on Christmas eve. CONTINUE READING: God Works In Mysterious Ways. The ending is so awesome. A reunion after so many years apart from each other. 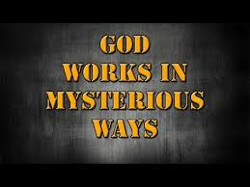 Indeed God does work in mysterious ways. Thank you Bill and Teddy for sharing this in the SE community.